In thinking about how funders can bring about positive social change, it is important to take into account that there are many different types of funder. 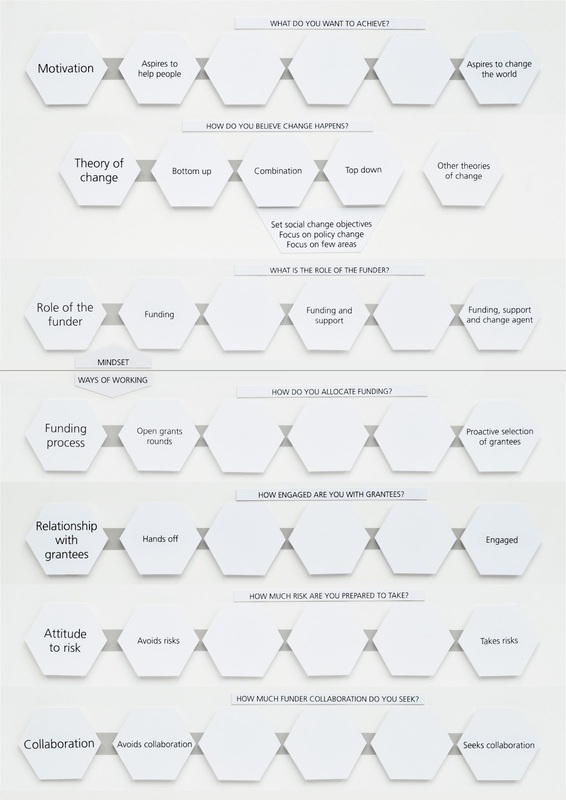 It was in grappling with this fact that we developed the Funder Spectrum Framework to help describe funders and differentiate between approaches to funding. The framework comprises seven spectrums, each of which describes a fundamental element of a funder’s approach. These are divided into two groups, relating to mindset and ways of working. In this blog I am going to talk about mindset. Interviewing a wide range of funders and philanthropists as part of our research for The Diana, Princess of Wales Memorial Fund gave us a strong sense that each funder has a distinctive personality, which both dictates and is influenced by their view of the world, their role in it and the way they actually go about their work. We have found it helpful to refer to this as the funder’s mindset. So, what do we actually mean by mindset and where does it come from? Well, there seem to be two crucial elements to the mindset. Firstly: motivation. What is it that principally motivates a particular funder or philanthropist? Are they driven mainly by a wish to respond to the immediate needs of a particular group, such as those suffering from poverty, or exclusion, or illness? Do they want to directly provide concrete help for these people, for example in the form of material support, educational or training programmes or the provision of healthcare services? And do they want to be able to see and measure the impact of their funding? Or, does a funder aspire to change the world in some way, to eradicate the source of a specific problem by bringing about a permanent systemic change? If so, are they in a suitable position to do this, given the scale of many social problems whether at home or abroad? Are they prepared to take a long-term approach, where the impact of their funding may take years to emerge and where outcomes may be impossible to attribute? What happens when a particular funder is motivated by both of these aspirations? Can their involvement in the provision of direct help to a particular group in fact enhance their ability to achieve more far-reaching systemic change? For those who are interested to read more on funder motivation, there is a brief article on the Fund’s website based on extracts from the forthcoming report, A Funder Conundrum, which describes our findings on what motivates the Fund. The second crucial element of a funder’s mindset is how they see their role. Do they believe that a funder’s role is just to provide funding or should a funder also consider using other methods in addition to funding - ‘Funder Plus’? If so, should this be confined to providing support to their grantees or is it acceptable for a funder to actually become an agent of change in their own right and get involved in campaigning or lobbying? A funder’s motivation(s) and their stance on appropriate roles together constitute a funder’s mindset. So, where do these two elements come from? In the case of an individual philanthropist it may simply be a set of personal preferences influenced by factors such as personal experience and the relative significance of emotion, compassion, optimism, cynicism, rationality, patience and so on. For a foundation, the source of motivation may be more opaque, comprising a mixture of the preferences of founders, trustees and of senior staff and informed by the organisation’s previous experience of funding. In either case there may also be some practical and contextual considerations such as the level of resources available and the nature of the desired social change. For example, with a funding pool of say £50,000, a two year timescale and a remit to address gender-based violence, are you best placed to support a women’s shelter or to change the behaviour of men across society to significantly reduce violence against women? The final point I want to make is that a funder’s mindset has a significant influence on the way they go about their work. A funder focusing exclusively on the direct delivery of a service to a defined target group and with the belief that a funder should only provide funding, is likely to have a very different approach (for example in how they engage with grantees) to a funder prepared to use every possible means to achieve an aspiration of bringing about a large-scale systemic change. A Funder Conundrum – what’s that all about then? I have been working on this project now for the best part of two years. I am part of a small team of evaluators appointed by The Diana, Princess of Wales Memorial Fund to carry out what they called a fund-wide evaluation in the lead up to their closure at the end of this year. The Fund (as I have come to know them) had taken the decision a few years earlier to spend its remaining capital and close at the end of 2012. Before departing though, it wanted to review what it had achieved and to share its experience and learning with other funders. So why are we about to publish a report called ‘A Funder Conundrum’? Well, this has been no ordinary evaluation. We have not just been assessing what went well and not so well and thinking about how to improve ways of working. The evaluation has actually been a much wider piece of research. Indeed the Fund asked us to address a number of questions. Chief among these was: How can funders bring about positive social change? Again, you might reasonably ask why a report addressing this question is entitled A Funder Conundrum. In starting to use the experience of The Diana, Princess of Wales Memorial Fund, as a launch-pad to examine the role of funders in achieving social change, we very quickly realised that rather than providing an answer to the question, what we first needed to do was to ask a whole lot of other questions. These included, ‘what do we mean by positive social change?’, ‘what sort of funders are we talking about?’, ‘do all funders even aspire to create social change?’ and so on. As we spoke to more people inside and outside the Fund it became clearer that these questions just form the tip of the iceberg. Any funder is faced by a myriad of questions about what they want to achieve, what sort of roles they see for themselves, and which methods they think are best. So, to return to the title for our forthcoming research report to be published in the autumn, the challenge for funders is to be aware of these questions and to be as clear as they can about their own answers to them. And yet, there is no simple answer to many of these questions and, even worse, the answers to different questions may stand in contradiction to one another – in other words, this really does constitute a funder conundrum. In future blogs I will talk about some of these individual issues and look at how different funders approach them. We will also be publishing a series of short articles on the Fund’s website, based on our research, which will give an additional flavour of the ground we have covered and the findings we have made. The first of these provides a fuller list of the questions and choices that face funders. If you would like to contact the Fund about their work, please email Andrew Cooper.